Helicobacter pylori bacteria. 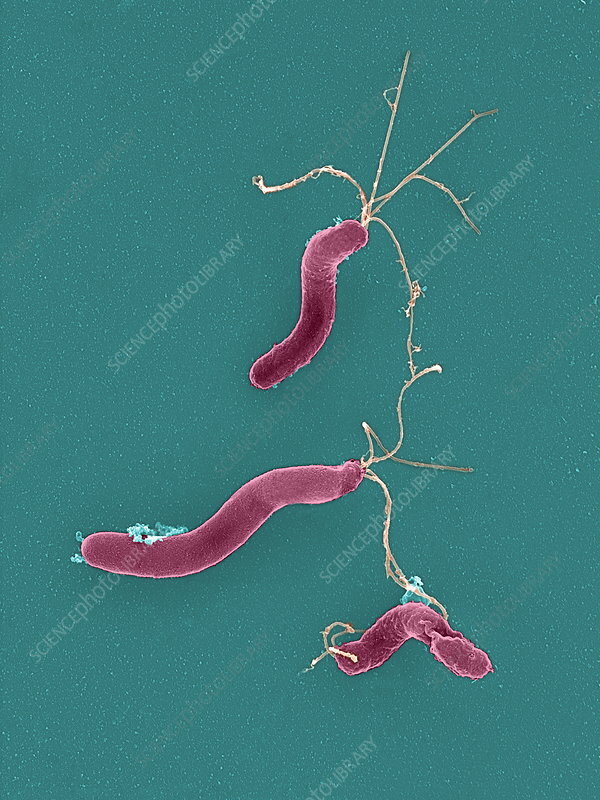 Coloured scanning electron micrograph (SEM) of three Helicobacter pylori bacteria. Formerly known as Campylobacter pyloridis, these are Gram-negative spiral-shaped bacteria. They are motile, possessing extensions, called flagella, that they use to propel themselves. H. pylori are found in the mucus lining of the stomach. They cause gastritis, and are also the most common cause of stomach ulcers. H. pylori may also be a cause or co-factor for gastric cancer as its presence increases the risk of developing stomach tumours. Magnification: x16,000 when printed 10 centimetres wide.